Gathering My Roses: Boyd Silver Works: Review & Giveaway, CLOSED! Boyd Silver Works: Review & Giveaway, CLOSED! Liz and I recently discovered the beautifully crafted and designed silver jewelry of Mary Pat Boyd of Boyd Silver Works. Mary Pat Boyd is a two-time Breast Cancer survivor and is a strong advocate for Breast Cancer Awareness. She has channeled her strong sense of compassion and creativity into crafting beautiful, unique pieces of wearable art -- many pieces dedicated to raising awareness of Breast Cancer issues. Mary Pat donates a portion of every Breast Cancer Awareness Jewelry purchase to Cancer Research and Awareness. Mary Pat has so many lovely items in her Silver Collection: Necklaces, Pins, Earrings, Bracelets, Rings, and one-of-a-kind pieces to melt your heart! Mary Pat Boyd has generously offered one of her amazing Breast Cancer Awareness pieces to giveaway to one of our readers. 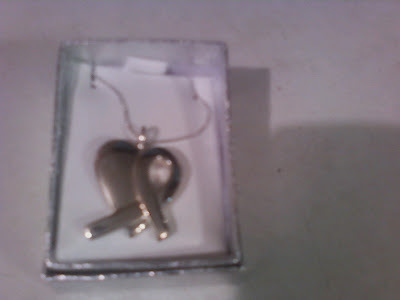 It's the Silver Awareness Ribbon and Heart Necklace. This Giveaway is open to USA only, please. Please look through Mary Pat Boyd's Collections and choose another item that you'd like to have. Please leave the link to it in your comment. 1. Sign the Boyd Silver Works Guestbook and let Mary Pat know how much you appreciate her efforts. 2. Do a Breast Self-Exam. Please. 4. Tell us how you will use this necklace to help bring awareness to the issue of Breast Cancer Research and Survival. 5. Purchase an Item from Boyd Silver Works and let us kow which item your chose. DISCLOSURE: I received no compensation (money or product) for this review. The opinions expressed herein are my own and based solely on my own observation and experience. I do Self Breast Exams regularly. I am a big supporter for fighting for a cure, I would wear it proudly & share information on the impotence on doing self breast exams. I actually just did a Cooks for the Cure Bake Sale & raised $86.50 for the Susan G Komen Foundation! I lost my mom to breast cancer when she was only 38. I would wear Breast-Cancer-Awareness-Pink-Ribbon-Jewelry-Earrings proudly. signed and commented on their guestbook. I am very good about doing my monthly exams. I would wear it daily and continue to remind friends and family to do their exams and to get mammograms. This is a beautiful symbol as a reminder to all women. Left a comment in her guestbook. This is something I could wear as a daily reminder to remind me and my friends and family to do their monthly exams and get mammograms. I love the Sterling Silver Inspirational necklace. I would love to have the One of a Kind Sterling Silver and Amazonite Angel Jewelry Bracelet. I left a comment in the guest book. I would give this necklace to my daughter-in-law, whose sister is battling breast cancer. I like the silver Angel earrings. I love the Breast Cancer Awareness Ribbon Earrings. Cute and Creative website!! :) Thanks for the giveaway!! Look forward to following you in the future!!! I love the Sterling Silver Awareness Ribbon ring. If I won I would give this to my future mother-in-law who just had breast cancer surgery. I really like the angel pin, so precious! I have a couple friends who'll love this, they are both breast cancer survivors. I would love to have this beautiful necklace for my mother-in-law who is a survivor of breast cancer. She is such a wonderful person. I like the http://www.boydsilverworks.com/item_158/Sterling-Silver-Purple-Awareness-Ribbon-Jewelry-Earrings.htm since my mom lost her life to pancreatic cancer in 2004. I do regular exams, and ask my fiance to also do them, as breast cancer isn't just an ailment for women! I would use this peice to spread the word about breast cancer, by offering this peice to my soon to be mother in law who is a Breast cancer surviver. Every time some on comments on this peice she could offer her story and possibly change a person's life through early detection! I am in a moms group and in October we celebrate Breast Cancer Awareness, if I won I would use this as a door prize for that meeting. I love the "Lace is More" sterling silver necklace. I love the Breast Cancer Pin. 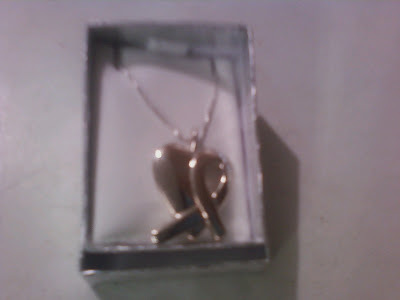 I would give this necklace to my cousin who is a cancer survivor! I would use the new itztags and have her continue it's travel to her sisters who are also survivors. Beautiful necklace. A close family friend has gone through breast cancer twice, and we always support any fundraisers to help with breast cancer. I love the Lace n more necklace. I always do breast exams regularly. I would love to give this to my mother. Her best friend passed away a few years ago after being diagnosed with breast cancer. They didn't catch it in time, and fought as hard as she could. it would be a great piece to remember her, and to support our family friend going through it also. I'd love to have the Nature on your Finger ring.